The recent recommendation by Major League Baseball that its teams expand protective netting between the playing field and stands at the ball parks is a good one. Too many fans have been injured by foul balls and bats flung into the stands, and the wise move is to follow the standard in Japanese stadiums. Spectators at Central and Pacific League games are shielded by screens not only behind home plate and the first- and third-base dugouts, but also from the left-field pole to the right-field pole, covering all of foul territory. Besides the netting, fans at Japanese games are warned when a foul ball is headed their way by whistles blown by stadium staff members. There are also constant reminders throughout games to watch out for foul balls, by way of P.A. announcements and video board message. When a foul ball does go into the seats, a stadium staffer goes to the area where the ball went, checking to make certain all the fans are OK and no one was injured after having been hit by the ball. The biggest reason fans get hurt, though, is they are not paying attention and not watching the game but instead chatting with friends next to them, buying a beer or other drink or food item from a vendor — or even talking on a cell phone. Baseball, concerned about the safety of players and others on the field, has over the past few years made rules changes to better protect them. For example, it is mandatory for first — and third-base coaches in MLB and NPB to wear batting helmets while on the lines. Tickets to sporting events, including NPB games, state in their terms and conditions printed on the reverse side a disclaimer declaring the teams and leagues not responsible for injuries to fans. Earlier this year, a woman claimed she lost the sight in one eye after being hit by a ball at a Nippon Ham Fighters game at Sapporo Dome. She filed suit and was awarded ¥42 million. After that, the team added to the whistles with a loud, old-time-car-sounding horn, “A-oo-ga, a-oo-ga,” sound effect to warn fans about approaching foul balls at home games. 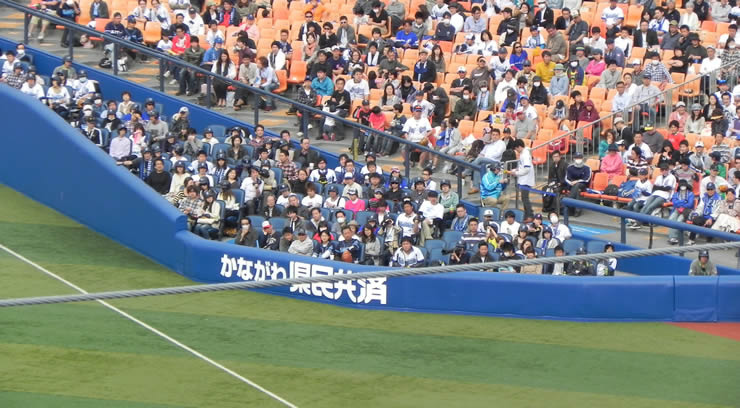 Ironically, Japanese parks have in recent years installed “exciting seats” where fans are close to the action with no netting or other protection in front of them. Each fan in the Tokyo Dome field seats gets a helmet to wear during the game and a fielder’s glove to snare batted balls hit into the section. The fans are told to use them, but many do not. The increased netting and “A-oo-ga” horns will help, but the fans have got to pay attention to the game. If everyone in the stands would anticipate a foul ball coming their way, there should be fewer incidents. Fans, keep your heads up at the games and have a Happy New Year.